Although there are many steps you can take to as part of redecorating your home, very few people stop to think about using mouldings as part of their efforts. Mouldings can be made from wood, plaster, steel, ceramic, or any one of many other materials. They can be simple half round shapes or complex hand carved shapes or cross sections, the selection is virtually unlimited allowing you to choose the perfect profile to complement the rest of the décor in your home. Wood has been extremely popular for use in creating mouldings for centuries. With nothing more than a router and the right bit it is possible to create an amazing array of cross sections. Add a skilled craftsman with the right tools, and wood can be carved into amazing shapes or have incredible images carved into it. You can use any one of a number of hardwoods such as oak, cherry, and maple for their amazing natural colors, or choose softwoods such as pine, fir, and spruce. They can also be easily stained to match your current or new décor. MDF or medium density fiberboard has become a very popular and inexpensive material for use in creating mouldings. In many cases this material is turned into custom shaped mouldings during the manufacturing process in which a blend of wood fibers and resins are poured into a high pressure moulding machine that turns the mix into a solid formed shape. However, as good as these mouldings happen to look when new, they must only be used in areas where they will not get wet or be subjected to high levels of humidity as this will ruin them. These mouldings must be painted to seal them at all times and do not look good stained. However they can add their own brand of beauty to any room in your home. 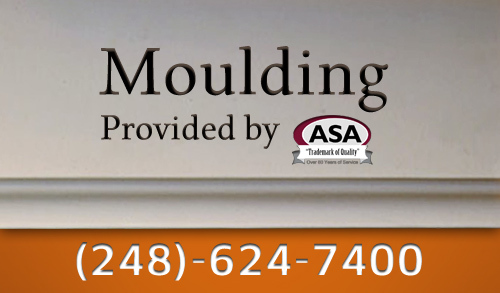 ASA Builders Supply Cabinet Corporation has one of the biggest selections of wood and MDF mouldings in South East Michigan, so you can guarantee that you will find something that will suit your needs and meet your tastes. Visit our showroom at 2040 Easy St. in Walled Lake, Michigan or give us a call at 248 624 7400 and we’ll get you that much closer to a finished and furnished home.